Bear's Lair- Luxury Cabin with Fantastic Lake View Wifi! Hot tub! 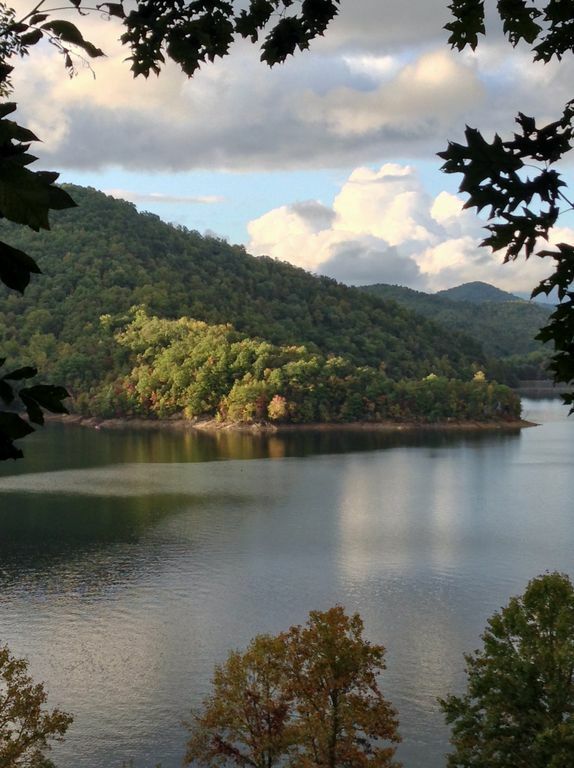 This is a great cabin overlooking Lake Nantahala with a fantastic view! Plan to relax in the Hot Tub while viewing the lake! Inquire about Pontoon boat rental and lake access options! Free wireless internet and free long distance phone calls for U.S. calls. The luxurious furnishings will dazzle you and the large decks overlooking beautiful Lake Nantahala will delight you in this four-bedroom, log home! King bed Master suite, plus 3 Queen bedrooms including one in open loft with breathtaking lake views. There is also a queen sleeper in downstairs den. This getaway chalet includes a great room with dining and kitchen looking out two stories of windows to the lake and Smoky Mountains, plus a second den. Sleeps 8-10, all in luxury beds. Satellite TVs, DVD, gas grill, comfy fireplace, great kitchen, and washer/dryer. Everything is included, just bring your pajamas, blue jeans, and come to relax and enjoy the views and cool weather or be as active as you like in the wonderful outdoors of the Nantahala Lake, river, and forest! We also provide a wonderful list of activities to do in the area. This is a FABULOUS home in a LUXURIOUS setting with Henredon and Drexel Heritage furnishings that will bring you back! We have paid close attention to every detail. A boat launch is just around the corner. Or ask us about lake access, and pontoon boat rental options. Want to know more? Email us now. This home has two dens! Large Selection for all ages. Outdoor Hot tub, Satellite TVs, Hi-speed internet. Outdoor firepit in natural surrounding. No Smoking indoors. Thank you! Beautiful place and very nice owner. The view was to die for, the cabin had every amenity you could ask for. It was cozy, comfortable and roomy all at the same time. It was close to our friend and convenient to everything. I highly recommend this cabin and would stay there again, I hated to leave. I hope we can return next year. Thank you for this 5 star review! Please come again! We enjoyed the long weekend very much. Cabin was very comfortable, quiet and relaxing, with a great view. Tried our hand at some fishing, but didn’t have much luck. Looking forward to a future trip back. Had an amazing trip up to the Bear's Lair Cabin. The owner sent a email with in an hour to confirm our trip. Beautiful cabin and beautiful views. We are coming back soon. Thank you for an awesome trip. The cabin was beautiful, amazing views, but we specifically searched for a cabin with a hot tub. The hot tub never got past 86 degrees. We were there for two nights, called and spoke with the owners and maintenance guy who all seemed genuinely well meaning, however no one ever came out to fix the tub. It was pretty disappointing. If it wasn't for that, it would have been a great trip. Great news! The hot tub now works! It was offline for two days, but has been repaired. Electronic controls in hot tubs are a bit tricky when buttons are pushed too many times, especially when children play with it. We are so glad you enjoyed our cabin and hope you return! Thank you! Loved it! The view alone is worth it. Cabin was wonderful. We agree! The view is great! Please come again! World Class Hiking, Casinos, and more! Cancellation Policy: Cancellations that are made more than 90 days prior to the check in date: A full refund of damage deposit and rental payment (less a $50 service fee and any credit card fees if applicable) will be provided. Cancellations that are made within 90 days of the check in date: A full refund of the advanced damage deposit will be made (less $50 and any credit card fees if applicable); however a refund of the rental payment will be made only to the extent that a tenant can be found to occupy the vacated time reserved under this contract. By reserving our home, you agree to these terms. Holidays are $260 per night or $1700 per week plus cleaning and tax.